In addition, the activity of the primary, rate-limiting enzyme that regenerates NAD+ – nicotinamide phosphoribosyltransferase (Nampt) – is reduced by aging,4 deconditioning.5 pathway that restores NAD+ status can be diminished to the extent it has clinical implications. Because NAD+ is closely linked to mitochondrial biogenesis, this is one reason why mitochondrial numbers can be reduced in these situations. Why Nicotinamide Riboside Instead of Other NAD+ Precursors? Nicotinamide riboside is found in trace amounts in various foods, including the whey fraction of milk.6 precursors are identified, there are differences in their effectiveness. Administration of nicotinamide riboside has been shown to increase intracellular NAD+ levels in murine and human cell lines.7 researchers demonstrated that oral administration of nicotinamide riboside increased tissue levels of NAD+ in a mouse model. Progressive axon degeneration (Wallerian degeneration) takes place in a number of neurodegenerative diseases, including peripheral neuropathy, Parkinson’s disease, and Alzheimer’s disease. Researchers at Washington University School of Medicine in St. Louis, Missouri, discovered that NAD+ pretreatment of injured axons – either from physical injury or chemotherapy-induced (vincristine) injury – protected against further nerve degeneration via SIRT1 up-regulation.15 Further research demonstrated exogenous application of NAD+ at the time of axon injury prevented degeneration.16 Some of these same researchers sought to determine whether NAD+ precursors could provide protection from neurodegeneration. In an elaborate set of experiments, niacin, niacinamide, nicotinamide riboside, and several intermediate molecules in the biosynthetic pathway to NAD+ were tested. Nicotinamide riboside was the only dietary constituent of the NAD+ pathway that provided axon protection; no protection was offered by niacin or niacinamide. Furthermore, the enzyme Nrk2 that converts NR to nicotinamide mononucleotide (which is then converted to NAD+) was increased 20-fold after neuronal injury, indicating NR’s significance in this process.17 Optic neuritis is an inflammation of the myelin sheath of the axons that make up the optic nerve and is often associated with multiple sclerosis (MS). Symptoms include vision loss, fading color vision, and pain; and a histological sign is loss of retinal ganglion cells. In an experimental MS murine model, intravitreal injections of either nicotinamide riboside or resveratrol helped prevent loss of retinal ganglion cells, most likely via SIRT1 activation, since the effect was blocked by a SIRT1 inhibitor. Further research is needed to determine whether oral administration would offer the same protection. The authors suggest these findings help confirm that, “SIRT1 activation is important for neuroprotection in CNS [central nervous system] demyelinating disease.”18 NAD+ depletion might be central to brain damage associated with ischemic stroke or traumatic brain injury. The proposed mechanism is the up-regulation of PARP in order to repair DNA. PARP is a NAD+ consumer, however, so if the area is flooded with PARP, then a relative NAD+ deficiency could occur.19 In an animal model of traumatic brain injury, intranasal NAD+ protected hippocampal neurons from destruction.20 It remains to be determined whether oral administration of nicotinamide riboside can provide such neuroprotection. Mitochondrial disorders, among the most common forms of inherited metabolic disorders, tend to be progressive and often fatal due to the lack of available treatment. Mitochondrial disease involving the muscles is referred to as mitochondrial myopathy and is associated with deficiencies of energy production in the electron transport chain. Histological aspects of myopathy include depletion of the mitochondrial NAD+ pool, structural abnormalities in skeletal muscle mitochondria, decreased mitochondrial number, and ultimately decreased ATP production. The metabolic targets of SIRT1 and SIRT3 were further elucidated in an extensive review.26 Among the key mechanisms associated with metabolic syndrome, SIRT1: (1) inhibits hepatic glucose production in obesity; (2) prevents liver lipid accumulation in hyperglycemic conditions; (3) enhances production of HDL-cholesterol; (4) regulates insulin release from the pancreas, improving glucose tolerance; (5) protects pancreatic beta-cells from destruction; and (6) attenuates insulin resistance and obesity-associated inflammation by increasing adiponectin. A review of SIRT3’s effects on metabolism shows: (1) inhibition of lipid accumulation in hepatocytes; (2) promotion of mitochondrial biogenesis in skeletal muscle, and (3) increased thermogenesis in brown adipose tissue associated with higher levels of SIRT3. 1. Canto C, Auwerx J. NAD+ as a signaling molecule modulating metabolism. Cold Spring Harb Symp Quant Biol 2011;76:291-298. 2. Yang T, Sauve A. NAD metabolism and sirtuins: metabolic regulation of protein deacetylation in stress and toxicity. AAPS J 2006;8:E632-E643. 3. Belenky P, Bogan K, Brenner C. NAD+ metabolism in health and disease. Trends Biochem Sci 2007;32:12-19. 4. Koltai E, Szabo Z, Atalay M, et al. Exercise alters SIRT1, SIRT6, NAD and NAMPT levels in skeletal muscle of aged rats. Mech Ageing Dev 2010;131:21-28. 5. Costford S, Bajpeyi S, Pasarica M, et al. Skeletal muscle NAMPT is induced by exercise in humans. Am J Physiol Endocrinol Metab 2010;298:E117-E126. 6. 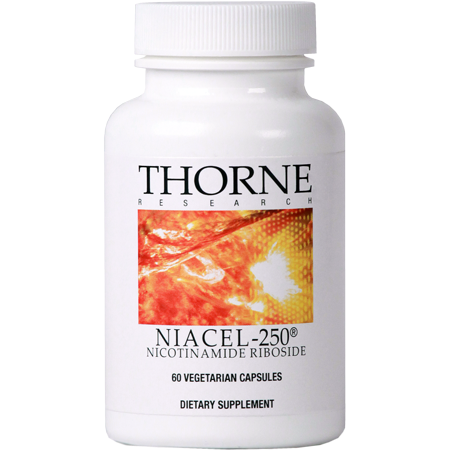 Chi Y, Sauve A. Nicotinamide riboside, a trace nutrient in foods, is a vitamin B3 with effects on energy metabolism and neuroprotection. Curr Opin Clin Nutr Metab Care 2013;16:657-661. 7. Canto C, Houtkooper R, Pirinen E, et al. The NAD+ precursor nicotinamide riboside enhances oxidative metabolism and protects against high-fat diet-induced obesity. Cell Metab 2012;15:838-847. 8. Yang T, Chan N, Sauve A. Syntheses of nicotinamide riboside and derivatives:effective agents for increasing nicotinamide adenine dinucleotide concentrations in mammalian cells. J Med Chem 2007;50:6458-6461. 9. Bogan K, Brenner C. Nicotinic acid, nicotinamide, and nicotinamide riboside: a molecular evaluation of NAD+ precursor vitamins in human nutrition. Annu Rev Nutr 2008;28:115-130. 10. Belenky P, Racette F, Bogan K, et al. Nicotinamide riboside promotes Sir2 silencing and extends lifespan via Nrk and Urh1/Pnp1/Meu1 pathways to NAD+. Cell 2007;129:473-484. 11. Braidy N, Guillemin G, Mansour H, et al. Age related changes in NAD+ metabolism oxidative stress and SIRT1 activity in Wistar rats. PLoS One 2011;6:e19194. 12. Lu S, Kato M, Lin S. Assimilation of endogenous nicotinamide riboside is essential for calorie restriction-mediated life span extension in Saccharomyces cerevisiae. J Biol Chem 2009;284:17110-17119. 13. Gomes A, Price N, Ling A, et al. Declining NAD(+) induces a pseudohypoxic state disrupting nuclear-mitochondrial communication during aging. Cell 2013;155:1624-1638. 14. Massudi H, Grant R, Braidy N, et al. Age-associated changes in oxidative stress and NAD+ metabolism in human tissue. PLoS One 2012;7:e42357. 15. Araki T, Sasaki Y, Milbrandt J. Increased nuclear NAD biosynthesis and SIRT1 activation prevent axonal degeneration. Science 2004;305:1010-1013. 16. Wang J, Zhai Q, Chen Y, et al. A local mechanism mediates NAD-dependent protection of axon degeneration. J Cell Biol 2005;170:349-355. 17. Sasaki Y, Araki T, Milbrandt J. Stimulation of nicotinamide adenine dinucleotide biosynthetic pathways delays axonal degeneration after axotomy. J Neurosci 2006;26:8484-8491. 18. Shindler K, Ventura E, Rex T, et al. SIRT1 activation confers neuroprotection in experimental optic neuritis. Invest Ophthalmol Vis Sci 2007;48:3602-3609. 19. Ying W, Xiong Z. Oxidative stress and NAD+ in ischemic brain injury: current advances and future perspectives. Curr Med Chem 2010;17:2152-2158. 20. Won S, Choi B, Yoo B, et al. Prevention of traumatic brain injury-induced neuron death by intranasal delivery of nicotinamide adenine dinucleotide. J Neurotrauma2012;29:1401-1409. 21. Qin W, Yang T, Ho L, et al. Neuronal SIRT1 activation as a novel mechanism underlying the prevention of Alzheimer disease amyloid neuropathology by calorie restriction. J Biol Chem 2006;281:21745-21754. 22. Bonda D, Lee H, Camins A, et al. The sirtuin pathway in ageing and Alzheimer disease: mechanistic and therapeutic considerations. Lancet Neurol 2011;10:275-279. 23. Gong B, Pan Y, Vempati P, et al. Nicotinamide riboside restores cognition through an upregulation of proliferator-activated receptor-γ coactivator 1α regulated β-secretase 1 degradation and mitochondrial gene expression in Alzheimer’s mouse models. Neurobiol Aging 2013;34:1581-1588. 25. Hirschey M, Shimazu T, Jing E, et al. SIRT3 deficiency and mitochondrial protein hyperacetylation accelerate the development of the metabolic syndrome. Mol Cell2011;44:177-190. 26. Nogueiras R, Habegger K, Chaudhary N, et al. Sirtuin 1 and sirtuin 3: physiological modulators of metabolism. Physiol Rev 2012;92:1479-1514. 27. Imai S, Kiess W. Therapeutic potential of SIRT1 and NAMPT-mediated NAD biosynthesis in type 2 diabetes. Front Biosci (Landmark Ed) 2009;14:2983-2995. 28. Yoshino J, Mills K, Yoon M, Imai S. Nicotinamide mononucleotide, a key NAD(+) intermediate, treats the pathophysiology of diet- and age-induced diabetes in mice. Cell Metab 2011;14:528-536.